St Augustines School 1940, a posed shot for George Swain as the children enact an air raid drill, there are a few others in this series, showing twisted lines of children waiting to enter, one of the other ones lines up with the wall and some door and windows behind this, but it’s such poor quality (a published and halftones photo) that I opted to base positioning the photo where the other one was without going by the window frames etc. So as far as I can work out this is correct. 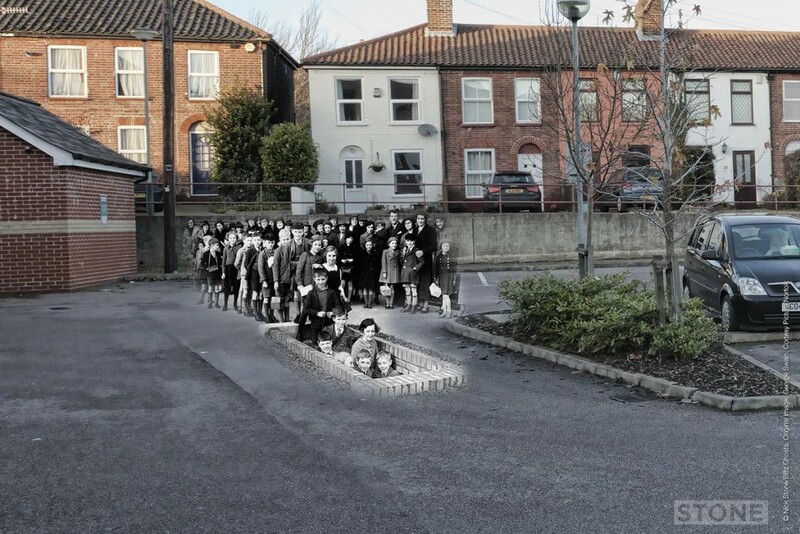 The air raid shelters were of some use, because the school was bombed, as you can tell by it being a swimming pool for many years and now a Spar shop and row of takeaways. You can also tell if you look through the set on Flickr as there are two ghosts of it, sitting there looking all nice on Aylsham Road. A friend’s father was at St Augustines, I think he said they lived on Calvert Street, neither of which exist in the form they did then, victim to the 1960s bulldozer, but he apparently remembered picking his way to school through bricks and broken tiles and glass, only to find it wasn’t there any more, that was in April 1942, two years after this photo was taken. The school didn’t reopen, the children were sent off to other schools in the area. I’ll let Stacia Briggs’ Mum explain what happened here opposite the school via Stacia herself, because she was there. My Mum’s house on Waterloo Road was destroyed by the Baedeker Raid. This looks like it might be her house. This is part of the real life account she wrote for my son for a project on WW2 – spot the similarities. “My father was away in the army and my mother and I lived in a small terrace house on Waterloo Road in Norwich, close to Magpie Road. One day, my mother and I had left the house to visit relatives. It was a good job we did go out, because that night, Hitler unleashed the Baedeker raids on Norwich and our house was reduced to a pile of smoking rubble. Everything we had was in ruins. Because I was only two, to me it just looked like a giant bonfire. I was upset that the toys I had were gone, although I hadn’t really had many, and that my cat was missing. We never saw him again. In those days, the fire service was voluntary and they were busy fighting the fires around the city. We heard that the Cathedral had been damaged and my mother quickly realised that we needed to find somewhere to stay. All we had was what we were wearing – nothing else. Everything had been destroyed. 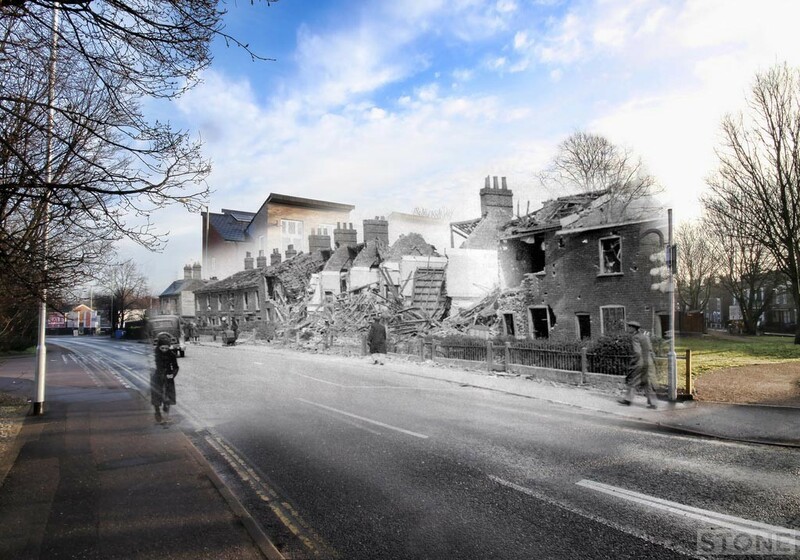 When my father heard, he blamed the anti-aircraft gunners in Norwich. He said they wouldn’t be able to hit City Hall if they were based at the Guildhall, which is just next door. I remember being really upset that my nursery, which was close to my house, had also been completely destroyed. My mother was doing war work and so I had often gone to the nursery and I’d loved it. The bomb site where the nursery had been was still there way into the 1950s – later, they built a swimming pool there – St Augustine’s. As far as I know, none of our neighbours were killed, although lots of others were killed in Norwich. We were lucky, although I’m sure my mother didn’t think so because she’d lost absolutely everything. Original photo and permission for manipulation and re-use courtesy Picture Norfolk. Just discovered this site, and I love it! Incredibly well merged photos and really interesting descriptions. Looking forward to more.